One of the first things you’ll do during a consultation is discuss your medical and dental history. 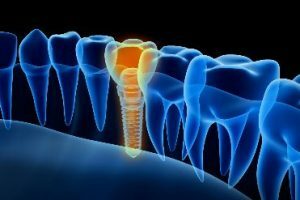 The health of your mouth and body are connected, and this information will give a dentist an idea of how well you’ll heal after an implant is placed, which is crucial to the success of the implant. You’ll also have several images taken of your teeth and jaws so a dentist can assess how much bone mass you have. This information is used to determine exactly where the implant would be placed and whether your jaws can adequately support it. Non-smoker – Smoking affects your ability to heal after implant surgery. In fact, the success rate for smokers is about 85%, compared to 98% for non-smokers. That’s why it’s recommended that you quit using tobacco before an implant procedure. Adequate bone mass – When a patient loses a tooth, their body begins the slow process of reabsorbing the bone that once surrounded it. The ideal patient will have enough bone remaining in their jaws to “hang on” to an implant. Reasonably good oral health – Patients with advanced stages of gum disease (also called periodontal disease) may not be the best candidates because implants require support from the surrounding gums and underlying bone to be successful. Remember, each patient is evaluated on a case-by-case basis, so don’t count yourself out just yet if you fall into any of these categories! In some cases, for example, if a patient doesn’t have enough bone in their jaw, a procedure called a bone graft can be done. This would be done prior to having an implant placed to “grow” the necessary bone mass in their jaw. Dental implants are a fantastic way to restore missing teeth and provide patients with decades of great oral health. Knowledge is power, so a consultation is well worth your time and effort to see if implants will work for you! Dr. David Tripulas is a general, cosmetic and restorative dentist who has decades of experience and has placed countless implants in that time. He always thoroughly evaluates each patient to assess their unique needs and goals so he can deliver the best result possible. If you have any questions, he can be reached via his website or at (979) 532-4663.